Bagged potting soil (compost) is so convenient isn't it? Cut open a bag, chuck a few handfuls into a pot, bung in your plants, and that's it. 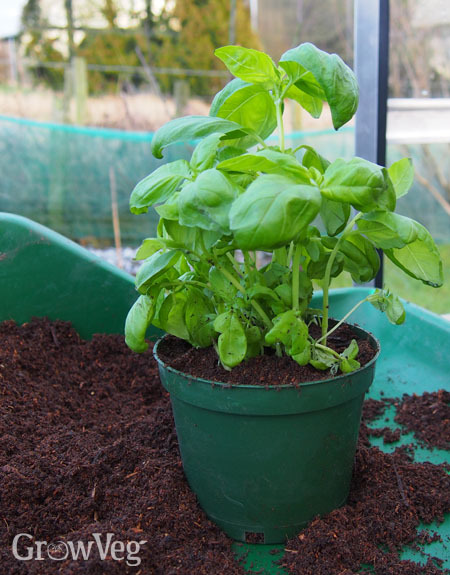 Most plants will grow well in it without a problem, but if you've ever bought a bag of stale potting soil (loam-based potting soils are especially prone to going 'off'), or if you've been less than satisfied with a crop's performance using commercial brands, it's worth having a go at making your own. Commercial loam-based potting soils also use stacked turves for the loam component, which are sterilized to kill off any weed seeds, pests or diseases. It is possible to sterilize soil in the oven at home or even in the microwave, but unless you only have a very tiny quantity of soil to sterilize, this just isn't practical for most of us. My preferred third ingredient is leafmold, which has a wonderful texture and retains moisture well. Most years I don't produce enough leafmold from my small garden for all my needs, but coir or composted bark make acceptable substitutes. Coir is usually supplied in compressed bricks that need to be soaked before use – I use a large, flexible, rubber bucket for this. It doesn't take long for the water to soak through the brick and, as if by magic, turn it into a lovely, fibrous, reddish-brown material that's ideal for potting mixes. Leafmold makes up the second part, or composted bark if leafmold is scarce. While neither of these adds much in the way of nutrients they do have good water-retaining properties and will help to maintain good structure in the potting mix. They are also full of microorganisms that do a great job of suppressing diseases. Coir is also fine to use. The third part of this recipe is compost. Ideally, your own garden compost, which will be rich and fertile, though bagged commercial compost (potting soil) can be used for this part. When using your own compost you won't usually need to add extra fertilizer for most crops. Greedy crops such as tomatoes and peppers need a potting soil that can provide plenty of nutrients over a long period, so my rich potting mix comprises just one part leafmold, coir or loam to three parts garden or bought-in compost. This will be sufficient to sustain these plants until fruiting time, when additional organic liquid fertilizers are needed. There is no one-size-fits-all potting mix, so the recipes above are just starting points. It's important to experiment and try different quantities and materials to find out what works best for you and your plants. The beauty of making your own potting mixes is that they are infinitely customizable. For example, if you want a mix that drains more freely, add some coarse sand or perlite. If you want a richer growing medium, incorporate well-rotted manure or wormcasts, or use comfrey leafmold in place of plain leafmold.